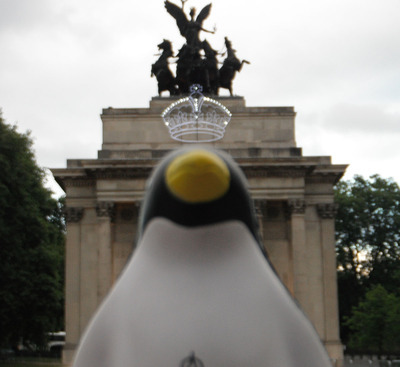 Pierre the Penguin, an unofficial Governors State University mascot, posed in front of a crown decoration on Wellington Arch in Hyde Park, London, England. The photo was featured in the article “"A Penguin in London Town" on pp. 1, 2 of the August 30, 2012 GSU View as part of a Take Pierre on Vacation contest. The photo was also announced as a second place winner in ""And Now, the Winners" on pp. 4, 5 of the November 26, 2012 GSU View.